">>I thought what the hell might as well try the extractor slot fix. I chamfered the edge of the cut out and rounded it over well." Please tell us more about what this fix entails (pics if possible). "I noticed the gun was closing up a little slow. This is nothing new if your gun is FTE. Sometimes a shell might eject but the bolt carrier has lost so much energy doing it and then stripping the next round that that is a common response... Then I analyzed the ejected shell casings. I noticed that the extractor cut out was distorting the hull and swelling out the plastic into a little bulge. It was driving up into the slot. Usually when a gun does this it will hang up obviously in the spot. And not cause fail to ejects... I thought what the hell might as well try the extractor slot fix. I chamfered the edge of the cut out and rounded it over well. Took the gun out and it has run like a scalded dog ever since! The bulged material was causing enough drag while being extracted that it was cause the FTEs like that even with high brass! I never thought that I would see any change after rounding the cut out. Just didn't think it could cause that much drag ejecting, thought all the troubles of the sharp edge was FTFs or slow feeds. But it all paid off." I will watch this thread closely, my friend was telling me about this today but like you wasn't quite sure what the fix was. I see the extractor slot on the end of the barrel, but I have no idea which edge he is giving the treatment. Hopefully Mike will see this and comment. You sure he isn't referring to the ejector slot on the bolt face, I was even thinking this could be a problem I don't know if this is from the ejector or just machining. That was weird it didn't post all of my reply. I was saying that there were scratches on the inside of the ejector slot but I am not sure if it was from the ejector or from machining. You may be right though, the bulges on the shell would make more sense if the slots he was referring to were on the barrel. I took a pic of what I think is the "extractor slot".... the slot that the extractor (on the bolt) slides into. The whole slot is in the yellow square, the edge I think he is talking about is in the red circle. That edge is sharp, but I don't know if that's the edge Mike worked on. He may mean that he worked on the whole length of the slot, don't know. The fix I was talking about is something most quality converters have been doing for awhile now. When I spoke of this fixing a FTE issue I was having in our full-auto... I have to guess that it was a pretty rare occurrence that it causes FTE's on the level it was in that gun. And I was very surprised when this solved that severe issue the gun was having. But I am also sure it isn't the only gun out there that the condition was in. The extractor slot work has mainly been used to help prevent your shell from either all together jamming into the area or robbing a lot of energy getting the shell past the catching area. 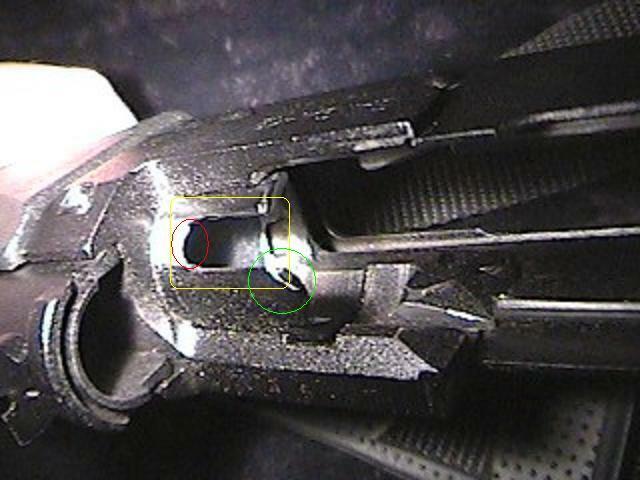 The main thing you will see happening from this is either an out right jam, a round that is almost chambered but the carrier stops short of closing the bolt, or sometimes it will chamber all the way but the carrier is noticeable slow in closing. The area you have circled in red is the area. The sharp area. You can round over the sharp area and it greatly helps let the shell chamber nice and smooth even if it does ride the area. You don't want to get crazy though. Just turn the sharp into a SMALL radius (working, move from underneath and up and slightly around to the top). Don't mess with the area circled in green. This angled edge helps start the bolts rotation to the locked position. It does take some wear but it usually reaches a point to wear it won't get worse. Hope this helps. This is a good thing to do to all guns. But don't be too optimistic that it will solve FTE issues. It was the last thing I did to the FA and was SUPER surprised of the results!!! Just the info we needed! Thanks so much for the details Mike! BTW, I'm also a very satisfied MD-20 customer. The red area is the part I have been having difficulty with. Thanks guys!!! If this is done correctly will you be able to ride the carrier into battery? I did mine (I think right) and there is still a hang up when the carrier is just short of closing completely. There is hardly any effort to get it to close, as it seems like the extractor spring is keeping it from freely closing. That shouldn't cause FTE problems I hope. I've also been wondering about & thinking of doing this. I've had shells actually hang up on that sharp edge in the past. I didn't file because I was fearful about tooling the breech. Now that I know it's no issue, I'll do that tonight! One step at a time. This seems to be a large step in that direction. Please be careful with this mod! The goal isn't really to eliminate the spring resistance on the extractor, you're still going to have that. If you read through everything carefully, the goal is to eliminate the sharp edge on the extractor slot that is biting into the shells, that's all. You're only going to remove a very tiny bit of material, no dremeling or anything.... just some slow passes with a small file to smooth over that sharp edge. Please go back and read Mike's explanation of what he did. Edit: I've seen that "bolt closes under it's own weight" video and I believe that was a rifle, not an S-12. I would not be trying to do that to your S-12. I certainly didn't and mine cycles fine. ET, I should have answered this before...... that is normal when you ride the bolt slowly. You'll have some resistance that last inch or so as the extractor hits that little ramp in the slot. Leave that alone! Gotcha. After shooting another 300 rounds this last weekend it closes freely so I'm happy. No more hangups! The slot doesn't bite into the shells either anymore as I looked at the cases that hung up in the weekend past and there were definitely indications. However this last weekend 100%. Awesome stuff! I'm guessing you may not get much response on the other mods (extractor mods) he spoke of. Some of the fine-tuning stuff like that goes beyond the scope of a simple forum posting and can lead to ruined parts/guns if not done carefully. I can't think of many cases where you'd need to get into that anyway (not required for great running gun). THAT SAME EXTRACTOR SLOT MOD ALSO WORKS WONDERS ON THE S-410, PARTICULARLY WHEN USING THE PRO-MAG 30RND DRUM. ALSO GROUND A SUBSTANTIAL BEVEL ON THE EXTREME END OF THE BARREL HOOD, AS THE PRO-MAG DRUM HAS A MUCH HIGHER FEED ANGLE THAN EITHER THE 10RND FACTORY, THE 2 1/2" FACTORY 4RNDERS, OR THE 15RND SUREFIRES. THIS HIGHER FEED ANGLE ON THE PRO-MAG DRUM WILL CAUSE THE SHELL MOUTH TO HANG ON THE END OF THE BARREL HOOD, AND CRUSH THE CASE MOUTH AS THE DRUM IS ROTATED TO LOCK-IN. THIS NOW-DEFORMED CASE MOUTH IS WHAT MOST OFTEN GETS HUNG ON THE SHARP-EDGED EXTRACTOR SLOT. THE SMALLER RADIUS OF THE .410 SHELL, VS., THE 12GA ALSO MAKES IT EASIER TO GET CAUGHT UP IN THE EXTRACTOR SLOT. GRINDING THIS BEVEL REMOVES THE PART OF THE BARREL HOOD THAT THE CASE MOUTH HANGS ON AND DEFORMS. THE TWO MODS, TO THE BARREL HOOD, AS WELL AS THE BEVELING OF THE EXTRACTOR SLOT SEEM TO WORK SYNERGISTICALLY TO PROMOTE BETTER FEEDING FROM THE DRUM MAG. It is a great mod. They SHOULD do it at the factory. Just be careful not to take much at all off the chamber. While you are at it, polish (remove no material) the face of the extractor and make sure the extractor moves easily in its slot in the bolt. Sometimes the extractor spring hole is not drilled properly and sometimes the extractor rubs the side of the slot in the bolt. These things are not necessary on most guns, but they can help with feeding and extraction issues. TRULY, MY FRIEND, IT'S NOT MEANT AS YELLING, IT SIMPLY PLEASES MY EYE, AS OPPOSED TO NON-BOLD LOWER CASE. I'M A TWO-FINGER HUNT-N-PECKER ON THE KEYBOARD, AND I CAN GET TWICE AS MANY WPM BY JUST LETTIN' 'ER RIP ON CAPS. BTW, THIS IS YELLING!!! TO ME ANYWAY (HOPE THAT DIDN'T LOOSEN ANYONE'S OPTIC NERVES))...). BUT TO THE SUBJECT, YES, I USE THE FINER OF THE THREE GRADES OF POLISHING BUFFS TO JUST BREAK AND POLISH THE 90 DEGREE ANGLE ON EITHER SIDE OF THE EXTRACTOR, WHERE IT INTERFACES WITH THE EXTRACTOR SLOT. THE EXACT SPOT WHERE THE EXTRACTOR TOUCHES THE EXTRACTOR SLOT IS ALSO A GOOD CANDIDATE FOR A DAB OF SHOOTERS CHOICE RED GREASE, BTW. ANOTHER SPOT TO MASSAGE IS THE RIB THAT PICKS UP THE ROUND FROM THE MAGAZINE. SPECIFICALLY, THE ENLONGATED PORTION THAT IS TO THE REAR OF THE BOLT FACE. I USE THE MEDIUM GRIT OF THE POLISHING BUFFS TO ROUND-OFF THE CORNERS OF THIS RIB, AND LOWER ITS HEIGHT JUST SLIGHTLY, AND FINISH WITH THE FINER GRIT BUFF. STAY AWAY FROM THE FORWARD PORTION THAT ACTUALLY PICKS UP THE NEXT ROUND FOR CHAMBERING. IF YOU'LL OBSERVE THROUGH THE MAGWELL, AS YOU MOVE THE BOLT BACK AND FORTH, THE ENLONGATED PORTION OF THIS RIB SCRUBS BACK AND FORTH ACROSS THE TOP ROUND IN THE MAGAZINE. THE MORE ROUNDED, AND LOWER, THIS PORTION OF THE RIB IS, THE LESS DRAG AND RESULTANT LOWER VELOCITY THERE IS ON THE RECOILING MASS (BOLT AND CARRIER). UNMODIFIED, IT IS SHARP-EDGED ENOUGH, AND HIGH ENOUGH THAT IT WILL LEAVE SIGNIFICANT LONGITUDINAL SCRATCHES AND DENTS ON THE BARNAUL STEEL CASED AMMO. LASTLY, THE DRUM ITSELF...........I BELIEVE IT IS ADJUSTED TOO TIGHT FROM THE FACTORY. IT APPEARED THAT THE TOP ROUND IN THE DRUM WAS APPLYING SO MUCH UPWARD PRESSURE ON THE BOLT/CARRIER, THAT IT WAS SLOWING IT TO A STOP, JUST SHORT OF EJECTING, PLUS, THE UPWARD PRESSURE FROM THE TOP ROUND WAS POPPING THE EMPTY LOOSE FROM THE EXTRACTOR/LOWER HOOK. ONE OR TWO MEMBERS ON HERE DISASSEMBLED THEIR DRUMS AND BACKED OFF THE ADJUSTMENT A HOLE OR TWO, AND THAT SEEMED TO WORK FOR THEM. NOT BEING QUITE THAT BRAVE, OR MECHANICALLY INCLINED, I SIMPLY LOADED MINE TO FULL CAP AND LET IT SIT FOR ABOUT 3 WEEKS, HOPING THE SPRING WOULD TAKE A SET. THAT, COMBINED WITH ALL THE OTHER MODS RELATED ABOVE, SEEMED TO DO THE TRICK. NEXT TIME OUT, IT RAN THE FULL 30RND DRUM, AS FAST AS YOU COULD TAP THE TRIGGER. OH, I ALSO ADDED ONE OF GUNFIX'R'S GAS PLUGS, AND WAS RUNNING IT ON #2. USED W-W PDX 3" FOR THE 30RND BLAST, AS IT SEEMS TO BE THE HOTTEST .410 ROUND, GOING JUST BY RECOIL, PLUS IT SEEMED TO BE THE MOST TEMPERMENTAL FOR FEEDING.